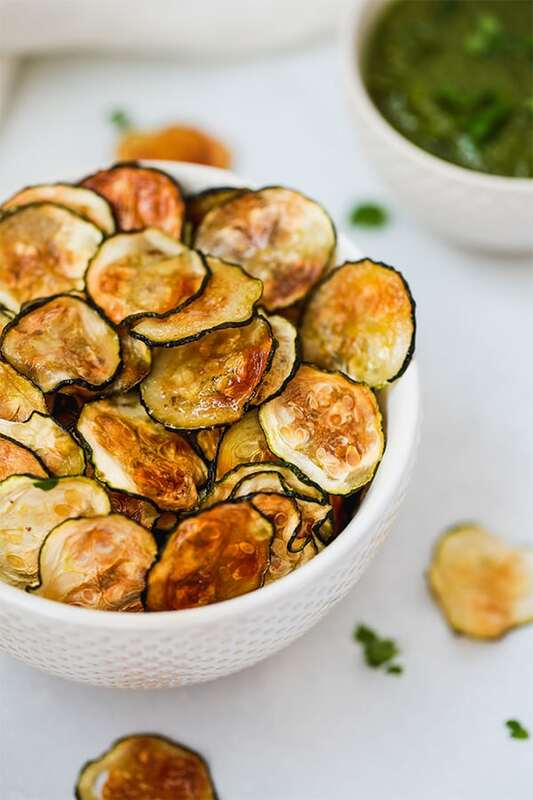 These low carb baked zucchini chips are an easy peasy snack that both kids and adults will love! They’re served with a tasty avocado green goddess dip and are paleo, AIP, and Vegan. No cheese or breadcrumbs here! I will forever be about the chip life. I grew up being obsessed with potato chips, only to have my love evolve for sweet potato chips, plantain chips, apple chips… basically all of the chips. Really, how can you ever go wrong with chips? They’re perfect for snacking, easy side dishes, and when made right they can be a great extra veggie. But let’s be honest… that’s rare. Chips are usually covered in unhealthy fat and have zero nutritional value. But not these! 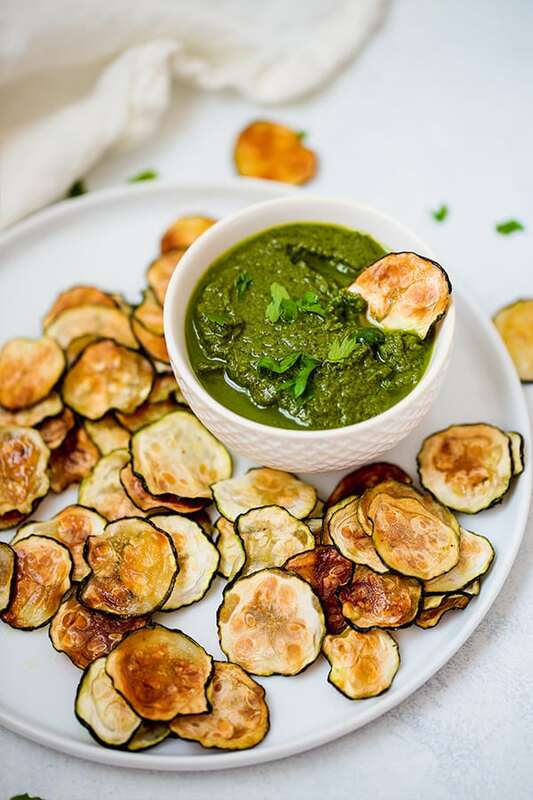 These baked zucchini chips are the perfect chip! Unlike what you’d assume you’d get with zucchini, these guys are not mushy at all! They’re perfectly thin and crispy! Plus, they’re made with healthy avocado oil rather than inflammatory seed oils. So perfect! They’re nice and crispy! No mushy or watery zucchini here. But my favorite part of this whole recipe has to be the dip! It’s is an avocado green goddess dip that’s packed with a rich herb flavor that pairs perfectly with the zucchini. Herbs are so nutrient dense and most of us just don’t use enough of them in the day to day cooking. Though the dip is optional and you could technically go without it, it’s an awesome addition. 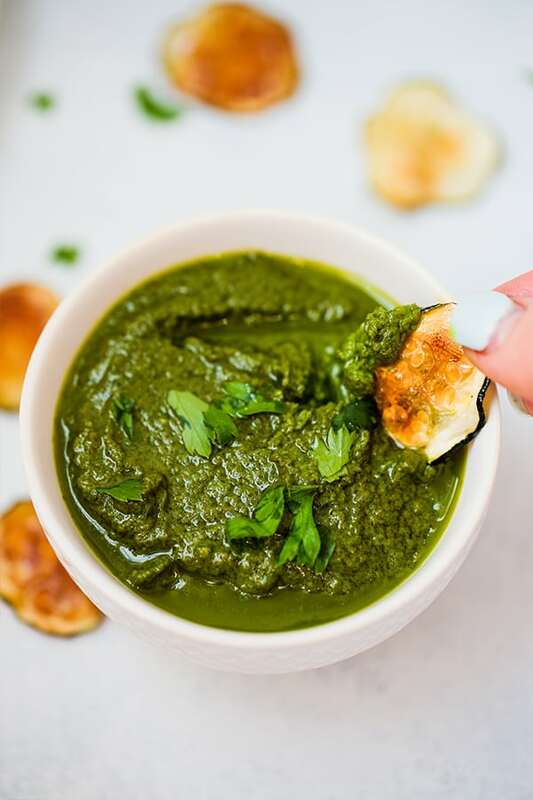 You can save the green goddess recipe for dipping other veggies as well. Another huge plus to these zucchini chips is that there’s no cheese and no breadcrumbs! 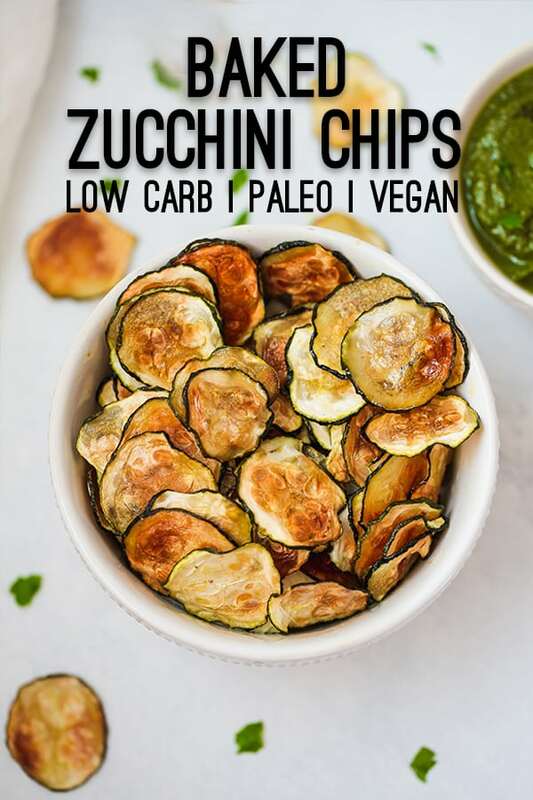 Most zucchini chips are made with Parmesan cheese or breadcrumbs to make them crispy… not here. Veggies are delicious on their own and don’t need cheese to make them taste good. These totally dairy-free, paleo, and even vegan. Avocado oil is what I used for these chips, but you can use other oils like melted coconut oil, and olive oil if you’re okay with using it in the oven. This is what I used to season the chips but you can easily just go with salt! These are the ingredients for the green goddess dip. Technically, you can go without it, but it’s a great addition! This is the best option for getting even slices. You can techincally use a knife, but the chips may not cook as evenly. 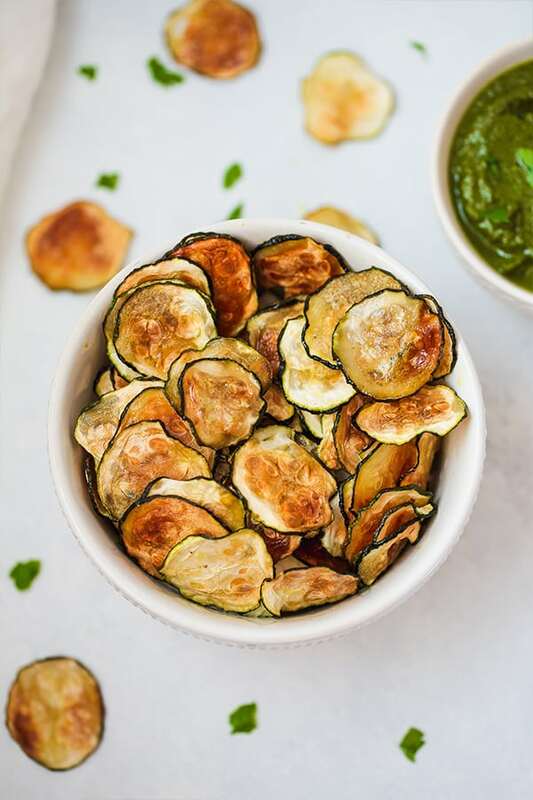 These low carb baked zucchini chips are an easy peasy snack that both kids and adults will love! Using a mandolin slicer, carefully slice the unpeeled zucchinis in 1/8″ slices, lightly patting the slices with a paper towel or napkin as you go to remove excess water. Place the slices onto the baking sheets, add the avocado oil and season with garlic, onion, and sea salt. Bake in the oven for 1 hour and 15-30 minutes. Check the chips frequently throughout the last 15-30 minutes as different slices cook faster depending on where they are in the oven. Remove the chips once crisped to liking and add more salt to taste if desired. Using a high-speed blender, blend all of the ingredients until thoroughly combined. Add 1-2 tbsp of more olive oil if the dip is too thick.